Following a dramatic announcement Thursday by Israel's attorney general, Netanyahu almost certainly faces indictment on corruption charges in the coming months. His main challenger leads him in the polls, and he is taking heat even from his supporters for forming an alliance with a racist ultranationalist party. Capping an investigation that began over two years ago, Attorney General Avichai Mandelblit announced his intention on Thursday to indict Netanyahu on corruption charges in a series of scandals . The most serious charge is bribery, for allegedly promoting regulatory changes that helped Shaul Elovitch, the head of telecom giant Bezeq, reap a hefty financial windfall. 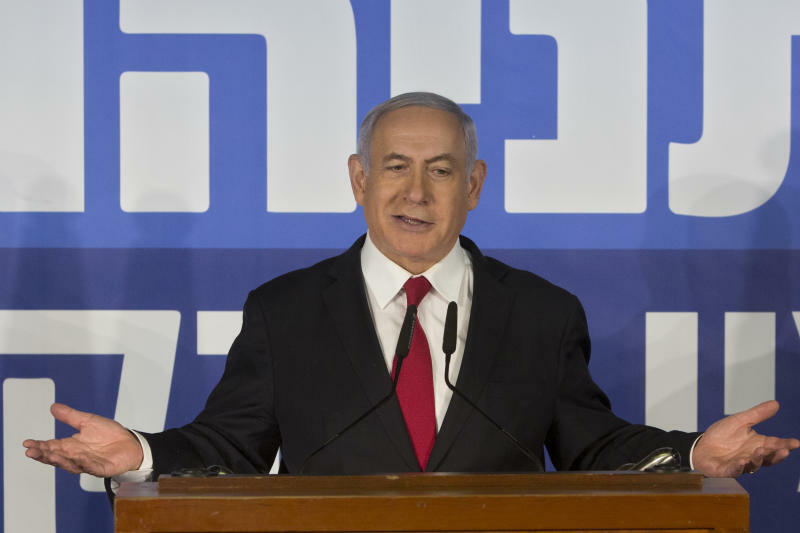 In exchange, Elovitch allegedly had Bezeq's popular news site, Walla, publish favorable items about Netanyahu and his family, while promoting negative coverage of some of Netanyahu's rivals. Perhaps the most embarrassing charge involves breach of trust, for allegedly accepting some $300,000 worth of champagne and cigars as gifts from billionaire friends. The revelations reinforced Netanyahu's image as a hedonist with expensive tastes and a propensity for letting others pick up the tab. Like his good friend Donald Trump, Netanyahu enjoys the staunch support of a loyal base that has remained firmly behind him during the past few years of police investigations. In addition, lawmakers in Netanyahu's Likud Party have lined up behind him. Thursday's announcement by Mandelblit is unlikely to change that. Responding to the attorney general's recommendations, Netanyahu sounded much like Trump, accusing prosecutors, police, the media and his "leftist" opponents of conspiring to oust him. This is a theme that plays well with the base and that he will likely continue to sound throughout the campaign. 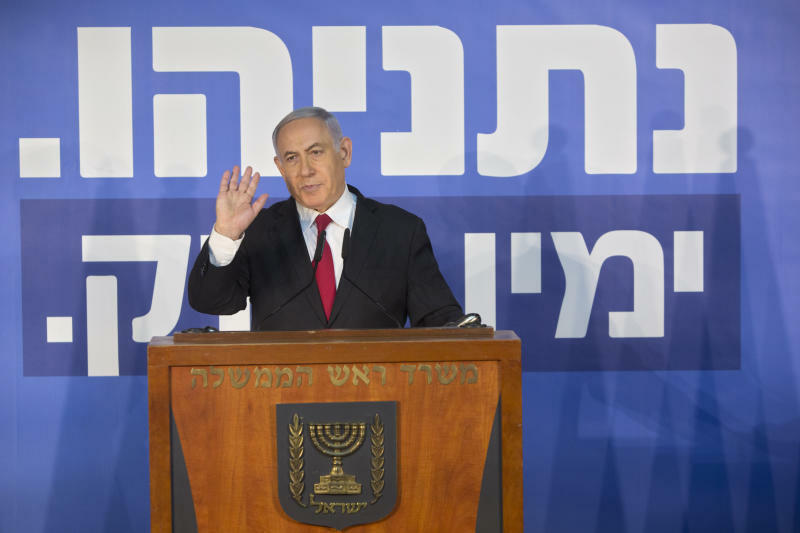 Under Israel's political system, the politician who has the best chance of building a majority coalition is chosen to be prime minister. Gantz's partnership with Yair Lapid, another popular centrist figure, has been welcomed by the public, and their new "Blue and White" alliance has jumped ahead of Likud in opinion polls. Netanyahu has also come under heavy criticism, even from allies like the pro-Israel lobby group AIPAC, for an alliance struck with the political heirs of the "Kach" movement, banned in Israel and the U.S. for its racist ideology. Gantz is now likely to turn the remaining weeks of the campaign into a referendum on Netanyahu's character. On Thursday, Gantz called on Netanyahu to resign while he fights his legal battle. "Unfortunately, today you chose a path that isn't befitting a prime minister of Israel," Gantz said. "Instead of choosing the good of the country, you chose your own well-being. It's the wrong choice and one we must be a part of." Yohanan Plesner, president of the Israel Democracy Institute, an independent think tank, said such a scenario isn't impossible. "I don't expect any dramatic shift in public opinion," said Plesner, a former centrist lawmaker. "But even a relatively small shift of a few percentage points moving from bloc to bloc can make a significant difference in the election." His legal troubles will provide both a major distraction and a potential conflict of interest. Netanyahu's job includes professional consultations with the same bodies that are prosecuting him. Any major decision, including domestic legislation, military action or diplomatic activity, will raise questions about Netanyahu's motives. This will be an important concern if Trump's Mideast team follows through on its promise to release a peace plan after the election. 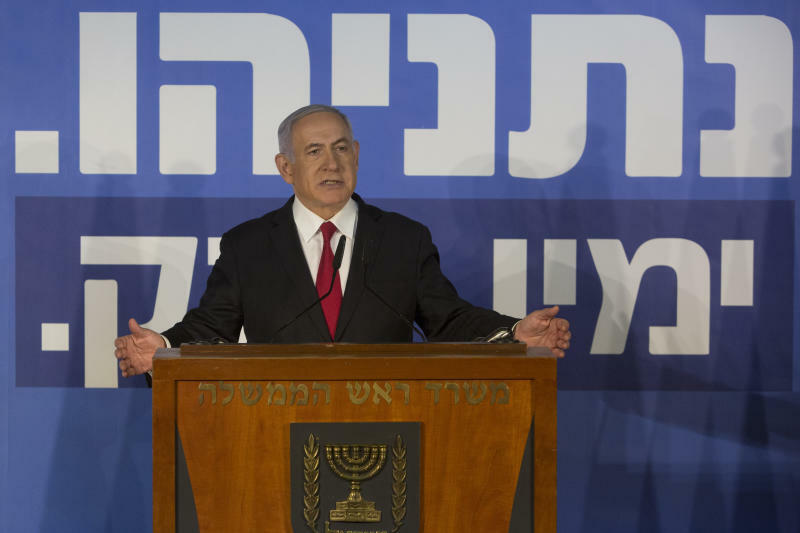 Netanyahu's ability to maneuver will likely be hampered. "Mandelblit's decision is not yet the final indictment. But it is a new millstone hung around Netanyahu's neck, a weight no previous Israeli prime minister has ever experienced," wrote Anshel Pfeffer, a columnist for the Haaretz daily and author of a recent biography about Netanyahu. "He will now have to carry it around wherever he goes, and it will drag him down," Pfeffer wrote.